Savoro, which means sour, is a sauce which my mother used to make whenever we had fried fish such as striped red red mullets (μπαρμπούνι), red mullets (κουτσομούρα) or other fish like bogue (γόπα) etc. The combination of vinegar and rosemary is a method they used to preserve food back when there were no refrigerators. Whenever we had fried fish, she would always make more so that we could have leftovers, to make savoro, which was a delicious mezes. Savoro, which probably has its roots from the Venetian dish “Pesse in saor”, is a dish also found in the Ionian Islands as, like Cyprus, they were also under Venetian rule. The classic Cypriot version of savoro as I remember it from my mother was that she would use the leftover oil after frying the fish to make a thick tomato sauce, with which she would cover the fish. Mix the flour with some salt and coat the fish. Heat the olive oil (at least 1 cm) in a non stick frying pan and fry the fish on both sides but do not add too many fish so that they get a crispy crust. Remove them in a heat proof vessel, preferably a Pyrex and continue with remaining. When done, remove most of the oil and keep just enough to wet the frying pan and add the garlic. Sauté for a few minutes and then add 2 tablespoons of leftover flour and mix to make a roux. Add the vinegar, rosemary, bay leaves and mix and finally the tomato, water, salt and pepper. Keep mixing until the sauce thickens. Pour the sauce on top of the fish to cover them and serve immediately. Leftover can be refrigerated covered in the sauce for a few days. This and many more Cypriot recipes ares included in my cookbook Mint, Cinnamon & Blossom Water, Flavours of Cyprus, Kopiaste as well as in Volume 1 of the e-cookbook. A healthy and tasty fish dish! Lovely! 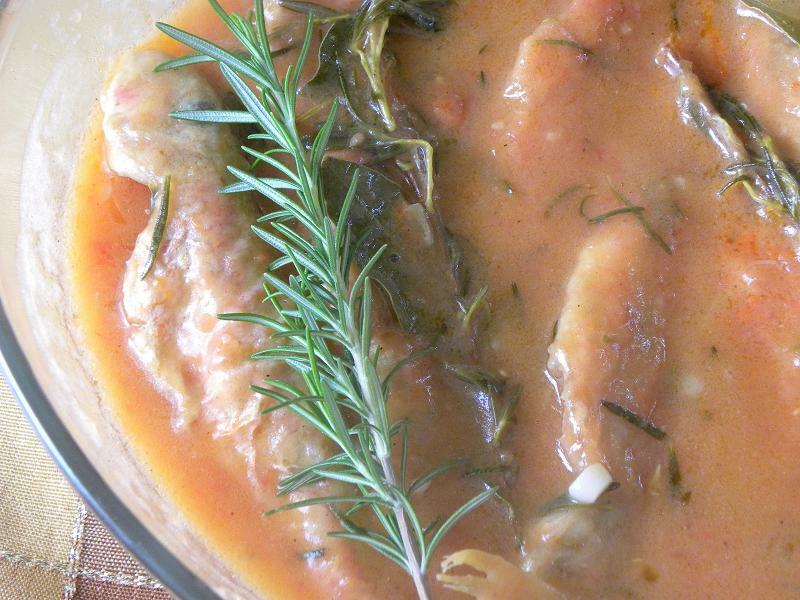 The sauce with rosemary sounds fantastic, and your fish are so fresh and pretty! Would love to taste this. That sauce sounds delicious! Love fish dishes and this one sounds fantastic. What an interesting sauce Ivy and I love red mullet. One of my favorite fish! Ciao Ivy ! I love your dish ! It’s funny because it’s like the savòr of Venise !!!! Natalia, I am sure there is a Venetian influence in this dish as well because they make a similar dish in the Ionian islands as well. what a delicious fish,ivy,the savory sauce,looks fantastic! My mum used to panfry these for the dinner table …. simply fresh and great. Oh but that looks SO good to me. I'm very hungry now! Red Mullet (plural), one of my favourite fish! I like red mullet a lot. The last time I had some was in Sicily (too long ago!) This is a very interesting sauce. I know I have heard of savoro before but never tried it. It looks and sounds delicious Ivy … a lovely sauce for this tasty fish. I love barbounia and I can often find them here in the fish markets.